The following message was delivered on behalf of His Eminence Robert Cardinal Sarah this September at the General Assembly of the Association Pro Liturgia, a group founded in 1988 to promote the correct application of the decisions of the Second Vatican Council. It was first published in French by L’Homme Nouveau; this English version by the authors of Canticum Salomonis is translated and published with his Eminence’s permission. I am happy to deliver this message of encouragement and gratitude to you on the occasion of your General Assembly. With assurance of my prayers for the intentions that are dear to your hearts, I would like to take this opportunity to express my profound gratitude to your president, M. Denis Crouan, and to each of you for your determination to defend and promote the liturgy of the ordinary form of the Roman Rite in the Latin language, even despite obstacles that stand in your way in this undertaking. This defense must not be mounted with weapons of war, or with hatred and anger in your hearts, but to the contrary, “Let us put on the breastplate of faith and love, and for a helmet the hope of salvation.” May God bless your meritorious efforts and ever make them more fruitful! I would like us to reflect together on one of the essential elements of Gregorian chant, namely sacred silence. 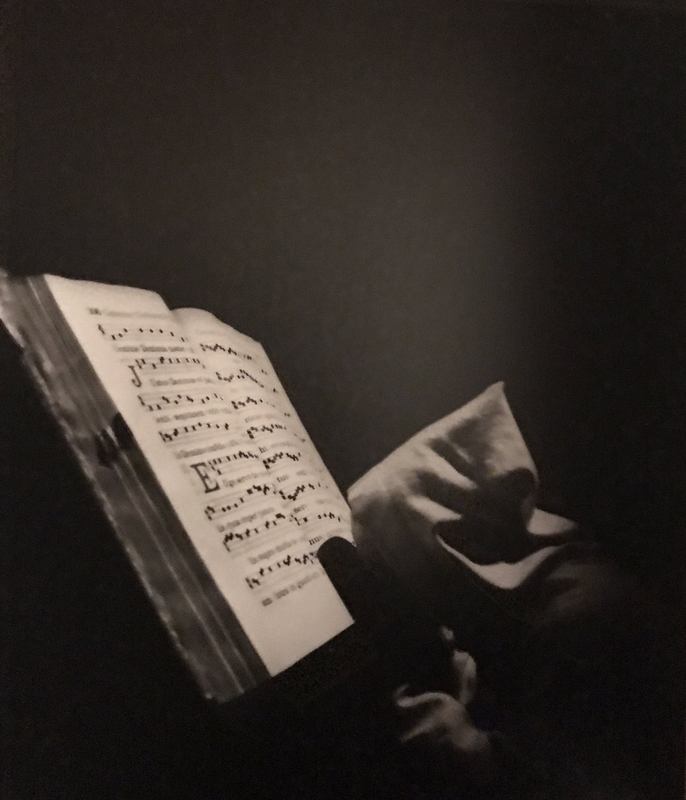 At first it might seem paradoxical, but we shall see that if Gregorian chant, which you defend and promote with so much zeal, has great importance, it is due to its indispensable capacity to draw us into the silence of contemplation, of listening to and adoring the living God. From the silence of the soul that is united to Jesus, to the silence of God in his glory: this is the title of this brief message that my friendship and support extends to you today. In fact, we shall see that Gregorian chant and its splendid visible raiment, the illuminated manuscript of the liturgical book, is born out of silence and leads back to silence. Gregorian chant rests on two inseparable foundations: Sacred Scripture, which is the basis for its texts, and cantillation. It is well known that from the shadow of their cloisters and their silent meditation on the Word of God, Benedictine monks in the course of the centuries developed, for the needs of the prayer of the Divine Office chanted in common, a cantillatory phrasing for each verse of the Bible that had to be proclaimed, beginning with the Psalms. What they did was to cloth the most holy Word of God, so delicate and subtle to the ear and eye, those double doors of the soul, with the very humble dress of a modal melody at once simple, elegant, and refined, and that respects the rhythm of the prosody. The ear, and also the eye, I said. For in fact, the monk chants and contemplates what he sings: from the first medieval manuscripts to the incunabula of the early Renaissance before the advent of printing (the Gutenburg Bible appeared in 1455), Psalters and Antiphoners, then Lectionaries and Gospel Books were progressively covered with ornaments and illuminations. The ornate letters used for the titles of works and principal divisions took on a great variety of forms: Gothic ornaments, crests, initials in gold...They depict characters of that age as diverse as the laborer, the artisan, the minstrel, the lady of the manor spinning wool at her wheel, but also plants, fruits, and animals: birds of many colors soaring toward heaven, fish sporting in the nourishing tide of the river...The hall where the monk-copyists worked was called the “scriptorium.” Like Gregorian chant in the slow and patient course of its genesis, the work of the copyists was a fruit of their silent meditation, for they were required to work in silence and in intimate contact with God. This is why, lest they should be disturbed, only the abbot, the prior, the sub-prior, and the librarian had the right to enter their room. The librarian was charged with giving them what they had to transcribe and furnishing them with all the objects they might need. And thus, to pray is to sing, to make the vocal cords of the heart speak: a monastic prayer that always begins in the privacy of the cell and continues unabated into the abbey sanctuary. Only the quality of each monk’s silence and personal prayer can make the community’s prayer deep and sublime. It is thus a prayer that has become eminently communitarian and unanimous, pronounced in a loud voice, with full lungs, during eight hours each day: an exhausting labor, but one that regenerates and sanctifies...This praise is the Gregorian chant that mounts up to the altar, to the stone of the Holy Sacrifice. The Catholic liturgy thus unfolds in a very slow dance, like that of King David before the Ark, throughout the whole interior space of the Abbatial Church, between the columns and down the length of the nave. It leads the chant to stroll as if in procession, making a majestic round about the altar...In front of the altar of the Holy Sacrifice, after the offices of Vigils or Compline, before returning to his cell where absolute silence reigns, the monk remains alone, on his knees near his stall, his hand sometimes placed on the misericord, as he contemplates the Cross. In fact, the Gregorian chant we find in the illuminated manuscripts is actually the heavenly liturgy, identical to the one that is represented, prefigured, accomplished, and actualized here below in the monastic liturgy, a genuine anticipation of the real presence, visible, tangible, and substantial, of the invisible Reality par excellence, of the Lamb standing as it were slain. A silence where God lets himself be seen in the flashing rays of his Glory through the beautiful rituals of the liturgy of the Church on the road toward her consummation. In fact, in a number of abbeys, such as Sénanque, Bonneval, or Quimperlé, the crucified Jesus appears sovereign even in his crucifixion. He is represented not as? dead but with his eyes open, not naked but clothed in a royal vestment, like Christ the Pantocrator in Byzantine art. The Crucified and Risen One embraces the whole universe in a grand gesture. If I have taken the liberty of recalling briefly the origin of Gregorian chant and its visual medium, the illuminated manuscript, it is to allow us to observe the criteria par excellence of liturgical chant: it gushes out from the silent contemplation of the mysteries of Jesus on this earth, the Incarnation and the Redemption, and leads us into the silence of adoration of the living God, the Most Holy Trinity: the Father sitting on his Throne of Glory made of jasper—a shining and transparent color—and sardius—a purple color—, surrounded by the rainbow of God’s fidelity; the sacrificed lamb haloed with the uncreated Light, He who alone is worthy to receive power, wealth, wisdom, strength, honor, glory, and praise; and the Holy Spirit, spring and river of living water rushing from the Throne and the Heart of the Lamb unto eternal life. This criterion, which as we have seen prevailed during the slow, progressive elaboration of Gregorian chant, is the ultimate key that admits us into a profound understanding of the exceptional and incomparable place given to it by Sacrosanctum Concilium, Vatican II’s constitution on the sacred liturgy, in the often-lauded paragraph number 116: “The Church acknowledges Gregorian chant as specially suited to the Roman liturgy: therefore, other things being equal, it should be given pride of place in liturgical services.” This eminent, even primary place is not only due to its historical precedence, but above all to the Church’s recognition of the unequaled intrinsic value of this chant, inspired by the Holy Spirit, which constitutes the model for the development of other forms of music and liturgical chant. Later, the same number 116 speaks precisely on this subject: “But other kinds of sacred music, especially polyphony, are by no means excluded from liturgical celebrations, so long as they accord with the spirit of the liturgical action”. Let us take one example: rhythm. It is clear that the syncopated rhythm—which consists of starting a note on the weak beat of a measure or on the weak part of a beat and continuing it on the strong beat of the following measure or on the strong part of the following beat— so typical of contemporary music, especially of commercial music, ever since the appearance of jazz, is little suited to meditation that leads from silence to adoration of the living God. Someone who does not perceive this is likely already tainted by this blindness and deafness that are a result of our immersion in a profane and secularized world, without God and without faith, saturated with noise, agitation, and barely-contained fury. Therefore, musical rhythm tends to disclose an undeniable reality: the presence or absence of contemplation. In other words, it is symptomatic of the manner in which liturgical singing flows or does not flow from silence and prayer. In fact, there exists a “body language of silence” and the rhythm of liturgical song? is this body language: silence as a condition of the Word. The Word of God, that is, and not the loose verbiage produced by one who walks after the flesh, and thus silence is a condition for authentic liturgical singing: “In the beginning, God made the heaven and the earth…”: It is out of the interior of silence that God speaks, that he creates the heaven and the earth by the power of his Word. Further, the Word only takes on its own importance and power when it issues from silence...but the opposite is equally true in this case: in order for silence to have its fertility and effective power, the word must be spoken out loud. St. Ignatius of Antioch adds: “it is better to be silent and to be than to speak and not to be.” Hence the “sacred” silence prescribed by the Church during the holy liturgy. “At the proper times all should observe a reverent silence,” as Sacrosanctum Concilium affirms (no. 30). Liturgical chant is there to make us pray, and in our day its primary objective, even before leading us to meditation and adoration, is to soothe the inner maelstrom of our passions, of the violence and divisions between the flesh and the spirit. Rhythm is therefore a very important, even essential element of our pacification, of this inner piece that we recover or acquire by hard labor, in tears and toil. Syncopated rhythm breaks the silence of the human soul; rising from a strident and discordant melody, it comes against us like an aggressor, to tear apart our soul with axe blows and leave its pieces scattered all about, panting, in tatters. This is the suffering that so many faithful express when they come out from certain Masses, using words like “scandal,” “boredom,” “suffering,” “desacralization,” “disrespect,” etc. Yes, it is a genuine assault, a violent intrusion, a break in to the house of the soul, the place where God entreats with his creature as a friends speaks with a friend. Our contemporaries are right to be concerned about human rights; they should also reflect on this violation of an essential right: the soul’s right to privacy and its unique and ineffable relation with its Creator and Redemptor. To illustrate my point in a positive way, let us take two examples of beautiful liturgical chants besides Gregorian chant in your country, France, and on the African continent. In France, I am thinking of the songs in the Breton language that I have heard at Christmas in some parishes in which the rector, outside the church and dressed in his soutane, teaches the dance of his Celtic ancestors to the young children. There was no hesitation in his genuine zeal to transmit this immemorial patrimony to young people, who are too often disinherited and deracinated, and thus become strangers to their own culture. 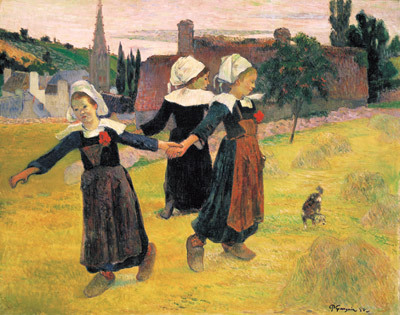 This priest from the countryside of Vannes shows them that the rhythm of the Breton dance in triple-time, which has nothing impure about it, unlike the well-known Viennese waltz, but rather resembles the breathing of a farmer tilling a field, or the swaying of cattle as they saunter toward the fields after milking, or the gentle rocking of the young spouse bearing her newborn and singing him a lullaby she learned on her own mother’s knee. The rhythm is in triple time without syncopation, which corresponds to human nature in both its most ordinary and its most noble activities: the toil of plowing and pasture-work or the weaning and education of a child. For the third beat, which closes the ternary rhythm, come from the natural “trinity” deeply inscribed in the soul of every person like a seal. It accords with the foot grounded on the earth, in the soil of our world, and thus the reality of a glob of clay endowed with an immortal soul, of a person created in the image of the Trinitarian God. This is the same rhythm that, on Christmas night, punctuates the songs intoned by the whole people with unparalleled fervor, to the silence of the adoration of the newborn Jesus, the Incarnate Word, in the splendid creche of a Breton church, where the eyes of all the children, big and small, converge: “Kanomb Noel; Ganet eo Jesus hur salver - Sing Noël, Jesus our Savior is born.” Such is the authenticity of a rhythm that respects human nature, respects the soul in its silent, loving relation with God its Creator and Redeemer. 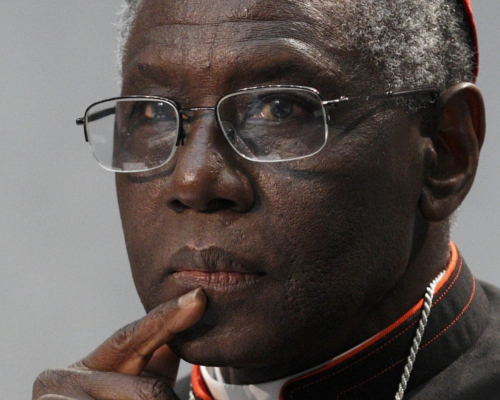 There is another example on the African continent in the liturgy of the monks of the Senegalese Abbey of Keur Moussa, founded by Solesmes in 1962, or, in my native land of Guinea, the Benedictines of the Monastery of Saint-Joseph of Séguéya, itself a daughter-house of Keur Moussa in 2003, whose chant is accompanied by a marvelous plucked string instrument, the kora, which is the African lute, and also the balafon, also called a balani, which is a sort of xylophone that usually has between sixteen and twenty-seven notes produced by keys of wood that are struck with sticks. For centuries the kora has been the sacred appanage of the griots, those musician heralds, storytellers, poets, historians, and chroniclers, repositories of the cultural memory of Africa and its oral tradition. When the African peasant works he sings following a natural ternary rhythm, with this third beat that recalls the foot firmly planted in the soil and dust of our earth. 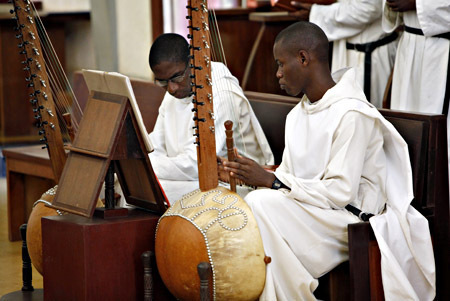 Father Luc Bayle, a monk of Keur Moussa and successor of Brother Michel Meygniot in the direction of the workshop, where he was responsible for the making of koras until 2007, says that “the kora is not in the foreground of liturgy. It is like a tide that carries the voice, facilitates the chant, and deepens its relation to God.” And it is true that the kora’s ternary rhythm, which induces a light swaying motion, gives the psalms life, permits them to express joy or sorrow, creates the desire to sing, to praise...sounds of a crystalline purity, with a translucent lightness, which leads us to the silence of adoration. Ah, wonder of creation! Oh, the splendid variety in the unity in God of the cultures that the Gospel has penetrated and transfigured, in a chant of a million voices for the Glory of the Eternal! Yes, from the shores of Brittany to African Guinea, there is only one step, and only Christ can help us learn it, so that we may enter into this unbreakable and luminous communion that is the Catholic Church, a dwelling place for diverse peoples. It has nothing in common with the artificial assembly, that formless magma cleaving to the world and dominated by money and power, a result of the leveling so typical of the profane and secularized world. In conclusion, let us recall the meeting between Jesus and Zachaeus. Our Lord never ceases to speak, in the depths of our soul, this word he addressed to that small man perched on the sycamore: “Zacchaeus, make haste and come down; for I must stay at your house today” (Lk. 19:5). This “coming down” that Jesus mentions, is it not the expression of his desire to join us in the intimacy of our soul, to scrap away all the dross of our sins, namely our refusal to love God and our neighbor? In silence, we can welcome God and have the ineffable experience of Heaven on earth. Yes, we carry heaven in our souls. And our singing, united to that of the angels and saints, gushes forth from a sacred silence that leads us into communion with the Most Holy Trinity.